Generosity in Action has a number of projects scheduled in the future. The project of supplying textbooks to schools in the Amazon basin will continue. In the spring of 2005 another group will travel on the upper Amazon and visit another village that has been identified as needing textbooks. Through International Expeditions, the tour operator, we will arrange in advance to purchase the textbooks and have them available in Iquitos to be taken upriver with the travelers who will deliver them. These supplies have been funded by travelers who visited a similar village on previous programs.. 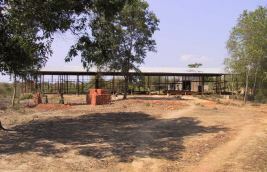 In Burma Tun Niang with a local tour agency we have completed construction of a school in the village of Thithataunkyun near Bagan. Soon after another village approached us for similar aid. We have agreed to build a second school during the summer of 2005. In addition a local High School has the need for a building to house laboratory equipment. Generosity in Action funding will build that building in 2005. . 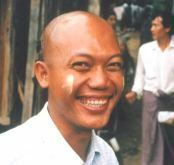 Recent visitors to Burma have provided much of the support to complete this project. 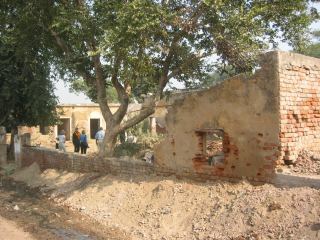 This photo is of a school under construction for a similar village. The project is being managed by the tour operator with whom Generosity in Action is discussing construction in Thithataunkyun. Click here for recent photos of Thithataunkyun. Water is always a need and gives an opportunity for a project. We have identified a third village near Bagan to get a well and hand pump. This project has been funded and we are simply waiting for the drilling to commence. The success of the projects in Burma is directly related to the support of the tour operator and guide who personally follow a project through to completion and send us digital pictures. Special thanks go to Kyaw Soe and Mr. Tun of New Horizons Tours in Rangoon for seeing that the goals of Generosity in Action are accomplished. In Dandu, India, just outside Bharatpur, near Agra and the Taj Mahal, travelers on a Palace on Wheels program in 2002 identified the need for a girl's school. The building that exists needs significant work to make it usable. Generosity in Action had the necessary funds to complete the task; however, there are significant issues with the local authorities such that we regret that we will not advance this project. The funds earmarked for this school have been allocated to another education project.